Not only is springtime ideal in and of itself for obvious reasons, but once you look at the cultural agenda, you'll see that it's also one of the liveliest times of the year to visit Spain. Throughout the country, local festivals and events fill up nearly every day of the calendar, so no matter where in Spain you find yourself, there will always be something going on. Read on to discover what to expect when you plan a trip to Spain in May as far as weather and events, as well as a suggested packing list with destination-specific tips. May sees temperatures rise by a fair bit throughout the majority of Spain, while the amount of rain drops a little on the whole compared to April. However, your experience can vary greatly depending on where you are. Central areas such as Madrid see pleasant temperatures in the mid-70s Fahrenheit throughout much of the month, sometimes surpassing 80 degrees by the end. Barcelona's coastal location means that temperatures are lower, but still don't tend to get cooler than the high 60s during the day. Elsewhere in the north, things tend to be a bit chillier (think low 60s and high 50s), and rain is more common than in other areas of the country. Down in the sunny south, Andalusia sees temperatures consistently in the high 70s and 80s throughout May, with plentiful sunshine and very little rain. May feels practically summer-like throughout much of Spain, so as far as clothes are concerned, think light, flowy fabrics that allow your skin to breathe. As for footwear, while flip-flops are fine for the beach, locals don't usually wear them around town. Instead, bring stylish sandals with a solid sole (you'll need support for all the walking you're going to do). If you're headed up north, consider layering your clothes as weather can be quite unpredictable, and throw in an umbrella lest you get caught off-guard by an unexpected shower. Cultural festivals and other fascinating events abound throughout Spain in May. Here's what to keep on your radar throughout the month. Mother's Day in Spain takes place the first Sunday of May every year. Andalusia's town fairs are in full swing throughout May. In 2019, the most famous—that of Seville—will take place entirely in May, despite its official name being the April Fair. Elsewhere in the region, Córdoba and Jerez also celebrate their ferias this month. 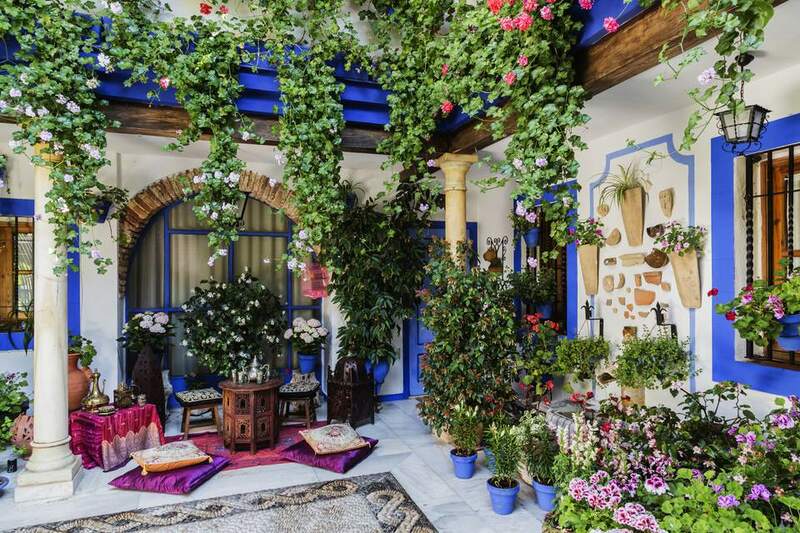 Speaking of Córdoba, the city's iconic floral patios festival and contest also takes place in early-mid May most years (May 6–19, 2019). Come marvel at the gorgeous floral displays that burst against the whitewashed walls of the city's typical courtyards. Up north, the Girona Flower Festival (May 11–19, 2019) keeps the floral fun going as colorful gardens spring up throughout the town center (are you noticing a theme here?). The San Isidro Festival in Madrid (May 11–15, 2019) celebrates the city's patron saint with a packed calendar full of parades, street parties, live performances and more. Although "high season" doesn't officially start until June for most of Spain, the nice weather and packed cultural agenda draw their fair share of visitors to the country throughout May. Book accommodation as soon as possible to guarantee your spot and avoid last-minute price hikes. To avoid long lines at attractions such as the Alhambra, Sagrada Familia, and Alcázar de Sevilla, consider reserving your tickets online in advance ahead of time. Still not sure May is the right time of year to plan your trip? Read our full guide to the best time to visit Spain to choose a season and destination that's right for you.